NOTE: This column is available through the New York Times Syndicate. For permission to republish it, please contact [email protected] or call 732-390-4480. RACIAL MCCARTHYISM is alive and well in Barack Obama's America, where reckless liberals hurl baseless charges of racism at critics of the nation's first black president. Remember ex-president Jimmy Carter attributing "an overwhelming portion" of the fervent opposition to Obama's health-care bill to "the fact that he is a black man"? Or actress/activist Janeane Garofalo smearing the Tea Party phenomenon as being "about hating a black man in the White House . . . racism straight up"? Or for that matter Obama himself, predicting that Republicans would demonize him because "he doesn't look like all those other presidents on the dollar bills"? Last week it was David Gregory's turn to play the race card. The host of NBC's "Meet the Press" accused Newt Gingrich of having used "coded, racially-tinged language" when he described Obama as a "food-stamp president" a few days earlier. "Do you want to be a country that creates food stamps -- in which case, frankly, Obama is an enormous success, the most successful food stamp president in American history? Or do you want to be a country that creates paychecks?" Gregory played a video clip of that passage from Gingrich's speech, then demanded that the former speaker explain its supposed racial subtext. Gingrich couldn't believe Gregory was serious -- "Oh, come on, David! That's bizarre, this kind of automatic reference to racism." He pointed out that what he had said "is factually true: 47 million Americans are on food stamps. One out of every six Americans is on food stamps. And to hide behind the charge of racism!?" You have to be tuned to a remarkably subtle frequency to detect any hint of racial animus in Gingrich's comment -- the same frequency, perhaps, at which adjectives like "skinny," "arrogant," and "articulate" turn into racist epithets. To be sure, Gingrich himself has sometimes played fast and loose with racial pejoratives; when Sonia Sotomayor was nominated to the Supreme Court, for example, he took to Twitter to tag her a racist. But he's innocent this time. The more-food-stamps-vs.-more-paychecks theme is one that Gingrich has been pushing for nearly a year. In memos last summer and fall, he urged Republican congressional candidates to point out that the use of food stamps -- "a key metric in gauging the health of the American economy" -- was going through the roof. When Congress was controlled by Republicans in the 1990s, he wrote, unemployment and food stamp usage plummeted. By contrast, "the Pelosi-Reid Democratic Congress" had led to rising joblessness and food-stamp rolls. The statistics he laid out had nothing to do with the president's color -- he hardly mentioned Obama -- and everything to do with drawing a contrast between "the Democratic Party of food stamps" and "the Republican Party of paychecks." 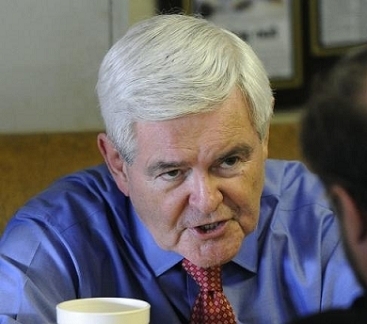 Now Gingrich is running for president, so he has adapted his food-stamp argument accordingly. His target is the Democrat in White House, not Nancy Pelosi's House Democrats. But the underlying message is no more racial today than it was last August. It's the Democratic and Republican attitudes toward welfare vs. work that Gingrich is spotlighting. Not Obama's race. 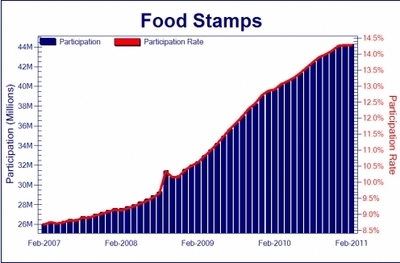 The number of Americans receiving food stamps has soared under Barack Obama. It soared under George W. Bush, too. There is no getting around the fact that food-stamp use is at an all-time high. In February, the most recent month for which federal data is available, 44.2 million people -- one American in seven -- were on food stamps. (Gingrich slightly misstated the numbers on "Meet the Press.") On Obama's watch, the number of recipients has soared by more than 12 million, setting a new high every month. But they soared on George W. Bush's watch as well. The number of food-stamp users went up in seven of the eight Bush years, climbing from 17.3 million in 2001 to 28.2 million in 2008 -- a 63 percent leap. Indeed, the Bush administration led a campaign to dramatically expand and destigmatize the use of food stamps, a campaign that began before the recession did. If Obama has been "the most successful food stamp president in American history," it is only by continuing what his predecessor began. The Bush record, in other words, dramatically contradicts Gingrich's message about Democrats being the party of food stamps. "Meet the Press" would have been a great venue to ask about that contradiction. Why did David Gregory opt instead to pursue a bogus racial "gotcha?" Is a long primary fight good for the GOP?